Today’s piece is a necklace. This Necklace is completely hand made out of copper wire and ribbon. Each of the rings and links were individually hand made out of copper wire. The ribbon is a combination of black and purple ribbon, threaded together with beading wire and small glass tubes. The necklace is also a “fusion” piece, which means that the necklace is made up of three bracelets. This piece is currently available! If you would like this piece, a similar piece, or any unique piece of jewelry; contact us! If you like what you see, please check out our website! Today’s piece is a Rosary bracelet. This Rosary bracelet is made with Mother of Pearl beads for the Hail Mary beads, Buffalo Bone for the Our Father beads. 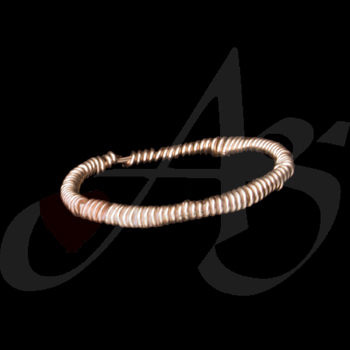 All the spacers in this bracelet are vermeil 18karat gold. The clasp here is also gold filled. This piece is currently available! If you would like this piece, a similar piece, or any unique piece of jewelry; contact us! If you are intrigued by what you saw today, check out our website! Today’s piece is a ring. This ring is a flexible ring. The ring is made with individual links, attached using our unbreakable rosary links. The stones in this ring are unakite. This ring is currently available! If you would like this piece, a similar piece, or any unique piece of jewelry; contact us! If you liked this piece, please check out our website! Today’s piece is a Rosary bracelet. 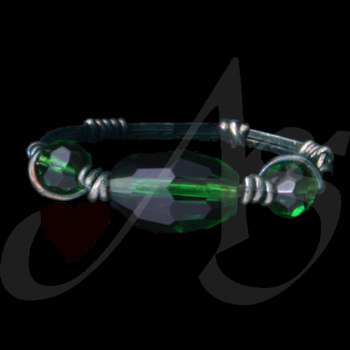 This Bracelet is made with different types of crystals and glass beads. The Our Father beads are round glass beds with flowers and vines painted on them. The Hail Mary beads are faceted pink Chinese crystals separated by green Swarovski crystals. This piece is currently available! If you would like this piece, a similar piece, or any unique piece of jewelry; contact us! If you like what you see, then feel free to visit our website! Today’s pieces are beverage charms. Just in time for the fall season, these beverage charms are autumn-themed. The items on the charm are: an oak leaf, a leaf, an acorn, and a pumpkin. 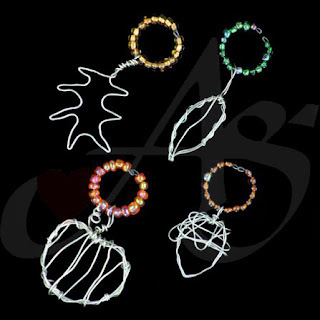 The wire loops are also decorated with colored seed beads; yellow, green, brown and an iridescent orange. These beverage charms are great for wine glasses, mugs, or even thermoses – anything with a handle! This piece is currently available! 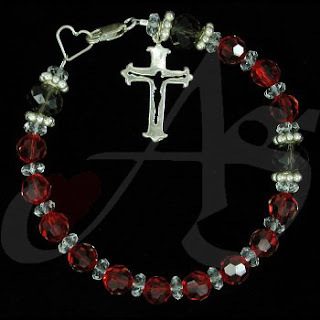 Today’s piece is a crystal Rosary bracelet. 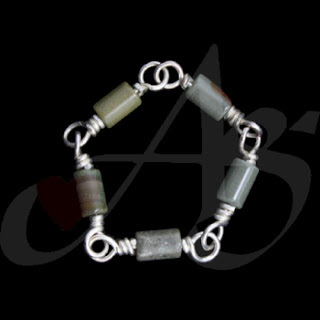 This bracelet is made with three different colors of Chinese crystals. The Our Father beads are a topaz crystal, the spacers are a clear crystal, and the Hail Mary beads are a read crystal. On either side of the Our Father beads are silver spacers, and the crucifix is sterling silver. This piece is currently available! If you would like this piece, a similar piece, or any unique piece of jewelry; contact us! If you like what you see here, don’t forget to check out our website! Today’s piece is a Rosary bracelet. This Rosary bracelet is made with crystals and silver, and with its yellow color is great for fall! The yellow crystals here are Chinese crystals, and the Our Father’s are a light brown Chinese crystals. Separating the crystals, and adding flexibility to the bracelet, are the silver bead spacers. This piece is currently available! If you would like this piece, a similar piece or a unique piece of jewelry; contact us! If you are intrigued by what you see, please check out our website! Today’s piece is a ring. This ring is made with hand twisted 14-karat gold-filled wire. The centerpiece is a pink rose quartz. 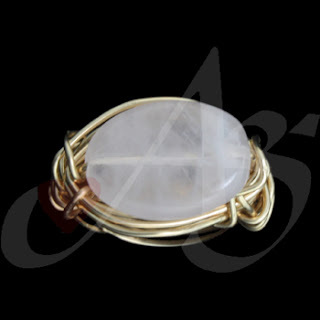 The quartz is inside a nest of gold-filled wire, which gives it a very interesting three dimensional look. This piece is currently available! If you would like this piece, a similar piece, or any unique piece of jewelry; contact us! If you would like to see more of our pieces, please check out our website! Today’s piece is a handmade, hand twisted Rosary bracelet. This bracelet is made with amethyst stones. The Hail Mary beads are wire-wrapped amethyst, and the Our Father beads are amethyst beads set in sterling silver. The clasp is a square lobster clasp, which is a different look from the regular oval, and gives a unique image to the piece. This piece is currently available! Today’s piece is a dainty pair of earrings. 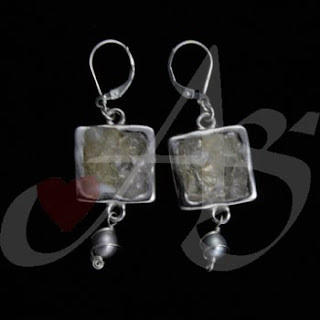 These earrings are made of nickel and glass. The blue beads on the bottom are frosted glass diamond-cut cubes with clear tubes on top of them. These earrings have kidney hook clasps. This piece is currently available. If you would like this piece, a similar piece, or any unique piece of jewelry; contact us! If you would like to see more pieces, check out our website! Today’s piece is a hand-made, wire wrapped ring. This ring was made from 14karate gold filled wire. This piece is currently available. If you would like this piece, a similar piece, or any unique piece of jewelry; contact us! If you liked what you saw, please check out our website! Today’s piece is a pair of earrings. These earrings are made with sterling silver squares. Inside the squares are opaque beige stones. Hanging from these silver squares are wire wrapped gray cultured pearls. This piece is currently available! If you would like this piece, a similar piece, or any unique piece of jewelry; contact us! If you like these earrings, and would like to see more, check out our website! Agape Gifts will be having a public show on Sunday, October 16th at Birth Choice Pregnancy Center in Clarkston, MI. 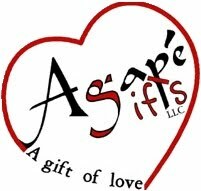 Agape Gifts will be hosting its 8th Annual Home Botique Show on Friday, November 4. please inquire for information! Today’s piece is a finger ring. This finger ring is made with hand twisted Sterling Silver. In the center are three green Chinese crystals. This piece is currently available! If you would like this piece, a similar piece, or any unique piece of jewelry; contact us! To take a look at more unique pieces, check out our website! Today’s piece is an orange pair of earrings. 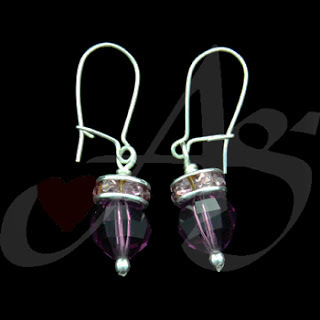 These earrings are made from a small mixture of earrings. The bottom roundel is many small Swarovski crystals set in between two silver plates. The large crystal in the center is a Chinese crystal. 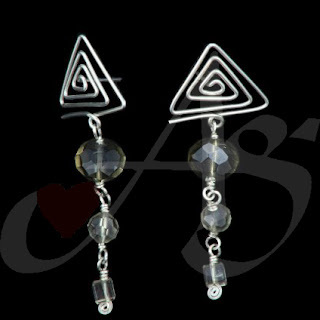 There are three sterling silver spacers atop the earring to give dimension. This piece is currently available! If you would like this piece, a similar piece, or any unique piece of jewelry; contact us! If you like what you see, don’t forget to check out our website! Today’s piece is a gold pair of earrings. These earrings are made with 14k/20 Gold-Filled wire, shaped so that they wear like a hoop earring. 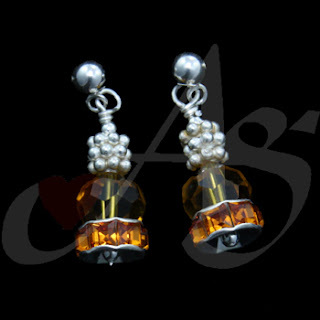 Dangling along the bottom of the earring are gold-colored Swarovski crystals, with gold-filled balls separating each crystal. This piece is currently available! P.S. If you would like to know the differences between Gold-Filled and Gold-Plated, please check out this article. Today’s piece is a pair of hand-stamped earrings. 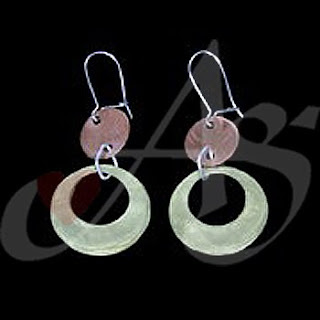 The earring is made up of two metal circles, punched out of sheet metal. The top circle is copper, the lower circle is brass. The brass circle is hollow in the middle, to give the piece dimension. This piece is currently available! 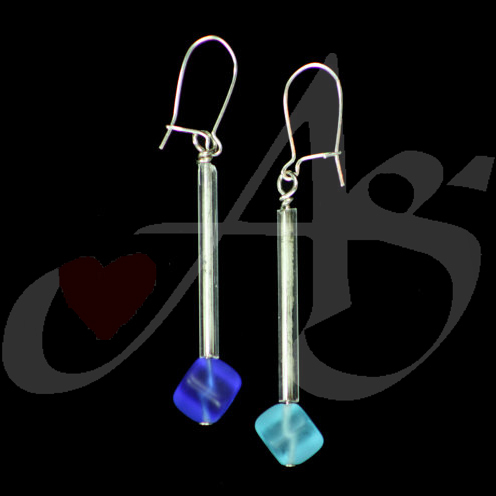 Today’s piece is a wonderful pair of handmade earrings. These earrings are decorated with multi-shaped faceted brown Chinese Crystals. The crystals are connected with the same strong wire twisting technique which we use for rosaries. This piece is currently available. If you would like this piece, a similar piece, or any unique piece of jewelry; contact us! Don’t forget that there are more individually unique piece on our website, check it out! Today’s piece is a wonderfully handcrafted necklace. This necklace is strung on leather cord, with an adjustable centerpiece. The centerpiece is made of polymer clay around a glass square. Inside the square is the word ‘hope’. On the reverse side of the centerpiece are handmade designs with the polymer clay. Embedded into the centerpiece are colored rhinestones. 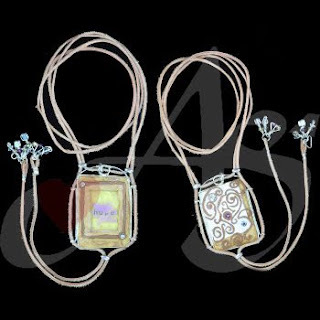 Hanging from the bottom of the necklace leather are clear Chinese crystals. This piece is currently available. If you would like this piece, a similar piece, or any unique piece of jewelry; contact us! Don’t forget to check out our website for hundreds of other individually unique pieces! Today’s piece is a necklace. This necklace is made with professional grade steel wire, sterling silver, and clear seed beads. 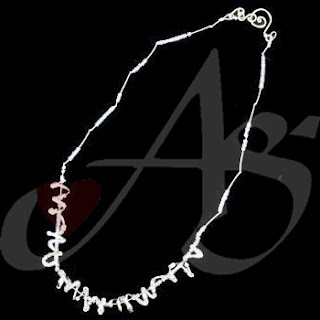 The seed beads are on the necklace, as well as strung on the sterling silver loops at the center of the necklace. The seed beads add a wonderful shimmer to the necklace. This piece is currently available. If you would like this piece, a similar piece, or any unique piece of jewelry; contact us! Don’t forget that there are hundreds of individually hand-crafted pieces of jewelry on our website – check it out! Today's piece is a sparkly pair of earrings. These are made with round faceted purple Chinese crystals and small faceted purple Swarovski crystals set into a roundel. 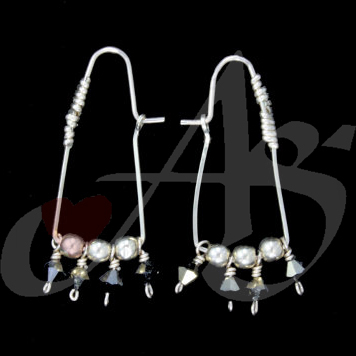 The ear hooks on this set are sterling silver lever backs. These earrings are currently available. If you would like this piece, a similar piece, or any unique piece of jewelry; contact us! If you like what you see, check out our website for more!